John Kenneth Muir's Reflections on Cult Movies and Classic TV: Ode to a Delta 88: The Classic Returns! "He absolutely loved it (the Delta 88), and it kept on getting destroyed, and he would rebuild it. He had a very sentimental attachment to that car..."
-Robert Primes (director of photography, Crimewave). Once upon a time, director Alfred Hitchcock was famous for making cameo appearances in his films. Today, Sam Raimi is almost as well-known for featuring his beloved car -- "The Classic" (a yellow Oldsmobile Delta 88 from 1973...) -- in his various Hollywood productions. Ash (Bruce Campbell) piloted Raimi's treasured Delta in Evil Dead (1983), Evil Dead 2 (1987) and even time-tripped with it in Army of Darkness (1993). 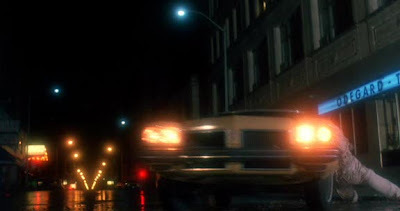 The director's car was also featured (and virtually destroyed...) in a nighttime car chase in the cult film, Crimewave (1985). More recently, it served as Cate Blanchett's clunker in The Gift (2000),and Uncle Ben's (Cliff Robertson's) car in Spider-man (2002). You can also see it in Spider-Man 3 (2007). The cinematic love affair between Sam Raimi and his car continues to this very day, with this week's Drag Me to Hell (2009). The 36-year old Oldsmobile returns as the conveyance of diabolical old gypsy, Sylvia Ganush. The Classic even has a good supporting role this time around too: showing up (malevolently) in a darkened parking deck, and later seen quiescently parked in the gypsy's driveway. 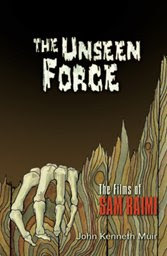 When I wrote The Unseen Force : The Films of Sam Raimi in 2004 for Applause Theatre and Cinema Books (now available on Amazon's Kindle...) I had the honor of interviewing several cast and crew members from Raimi's productions, and we inevitably got around to the subject of The Classic. Sheree Wilson, star of Crimewave told me that the car was indeed Sam's "baby" and that she got a lot of special privileges with it, "hanging off...dangling off... "(page 83) of it. After working on Spider-Man, the great Cliff Robertson told me that Raimi's Classic serves as the director's "signature." Roberson noted he was unaware of the car's deep significance until the "yellow Oldsmobile appeared on the scene" and his character died "in front of it at the Public Library." Robertson added that it would be "interesting to see" how Raimi is going "to put it in a futuristic movie..." (page 304), but that he was sure that Raimi would "find a way, being the inventive, creative man that he is..."
That's awesome that the "Classic" features prominently in Raimi's new films. I could be mistaken but I don't think it appeared in THE QUICK AND THE DEAD did it? There's a legend that the Classic appears in a barn in "Quick and the Dead" (A Western!") but I think the story might be apocryphal -- I've never been able to find it (I own a laserdisc copy of the film and have obsessively gone over the movie...). Maybe I just missed it?